Hate With Friends, a new Facebook app from Chris Baker. Hating movies, earworms, conventions of grammar, clothing brands, diet fads—you get the twinkle of pleasure without the glob of guilt, or the cold brush of fear. A Coldplay song doesn’t know you hate it. Not so, hating people. You must commit to the idea that the animosity you harbor runs toward another human being. Hating people is the final frontier of hate, the enmity big leagues, and crossing it feels like stepping away from the primordial bonfire into a gust of Ice Age wind. This old turn to the wilderness becomes new again with Hate With Friends, a Facebook tool by Chris Baker, who also co-created Unbaby.me. Sign into www.hatewithfriends.com through your Facebook account and you’ll be presented with all of your Friends in alphabetical order—and below each profile picture, a dark pink button (like, maybe it was light pink, and then your loathing darkened it?) that says, HATE HER or HATE HIM. From here, with any given Friend, three scenarios are possible. You can choose not to HATE HER and go chase butterflies or something. You can HATE HER, at which time the dark pink button will flip to spell out DON’T HATE HER, because hostility is a protean thing and sometimes changes its mind, and for the duration of your HATING she will live under a separate tab called WHO I HATE. In scenario three, you HATE HER, the button flips, she goes under the tab, and you get a notification. 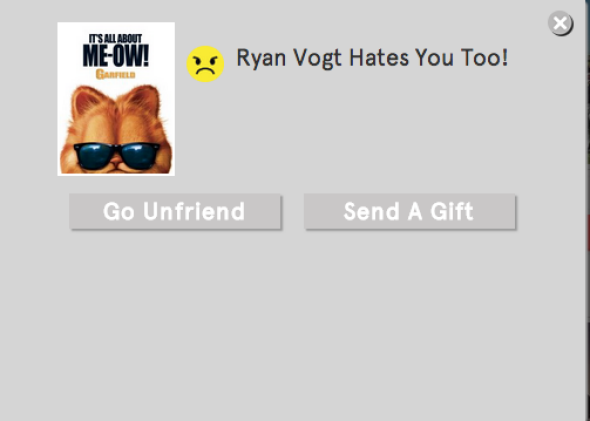 The notification says, “[Friend] Hates You Too!” and gives you the options of Sending Her a Gift (measles?) and Unfriending Her. And then she also goes under another tab called WHO HATES ME TOO, and then you cry. The difference between scenarios two and three is, of course, that the disgust is reciprocal: Hate With Friends will tell you about someone’s antipathy for you only if it knows you antipathize them back. You might recognize this Prisoner’s Dilemma-type setup from Baker’s inspiration, Bang With Friends (now known as Down), in which Facebook connections who want to hook up with each other are alerted to this fact, while unrequited longings flicker away in secrecy. But while the strategy of reviling everyone in your network to see who reviles you back has a certain foxy logic, I cannot recommend it because 1. It makes you feel bad and 2. It dilutes the force of your hates. I unhated all my colleagues and resolved to start over, to make my rancor count. The thing is, you don’t really think you have it in you to officially despise someone via Facebook widget. You start scrolling through your acquaintances, people you love and like and mildly dislike and find mostly annoying though they have some redeeming qualities. You start to suspect you live an emotionally tepid life. And then, suddenly, you find them. Your friend’s indescribably horrendous college roommate. The insufferable kid from high school. The other insufferable kid from high school. The chick who hit your dog with her bike and then inexplicably friended you on Facebook. That Guy. “It’s meant to be some fun and social commentary on the current status of Facebook,” Baker told ABC News, of his brainchild. And at least until a critical mass of users opt in, he said, he doubts the site will unearth any real mutual odium. But who knows. After staring into the heart of darkness or 20 minutes via Hate With Friends, I got dangerously into it. I found inner quarries and trenches of hate I never knew existed. The widget, though cruel, had broken through the sanitized, blue-and-white amiability of my Facebook account, and mind. Maybe Hate With Friends is evil. Maybe it will set us free.